It’s a new launch and it’s from SkinCeuticals – you can only imagine my excitement. You all know how often I give recommendations from this brand, as I truly have seen remarkable results through including their products in my routine. These products are jam-packed with actives that will result in actual change in your skin, which is what we are all after (especially in my case, as I’ve just turned 30). Their latest launch is aimed at intensive hydration which is exactly what my skin needs, being on the dehydrated end of the spectrum – it’s their H.A. Intensifier which, broken down into layman’s terms, is a really concentrated serum made up of Hyaluronic Acid (that’s the H.A part of the name), Proxylane and purple rice extract (I’ll break down what these all do for our skin a bit later). The H.A. Intensifier (R1550 for 30ml) is a corrective serum and comes packaged in a deep purple glass bottle with a dropper – the actual serum is a deep purple liquid which feels really lovely to use and sinks into the skin beautifully. I have been using this day and night and, like all SkinCeuticals products, there are different ways in which you can tweak this product to suit your skin and give you exactly what you need (I love this concept!). The serum can be used on its own (for intense hydration) or mixed in with one of your Skinceuticals Anti-oxidants from the Corrective range to tackle multiple concerns at a time. I have been doing a few drops of the H.A. 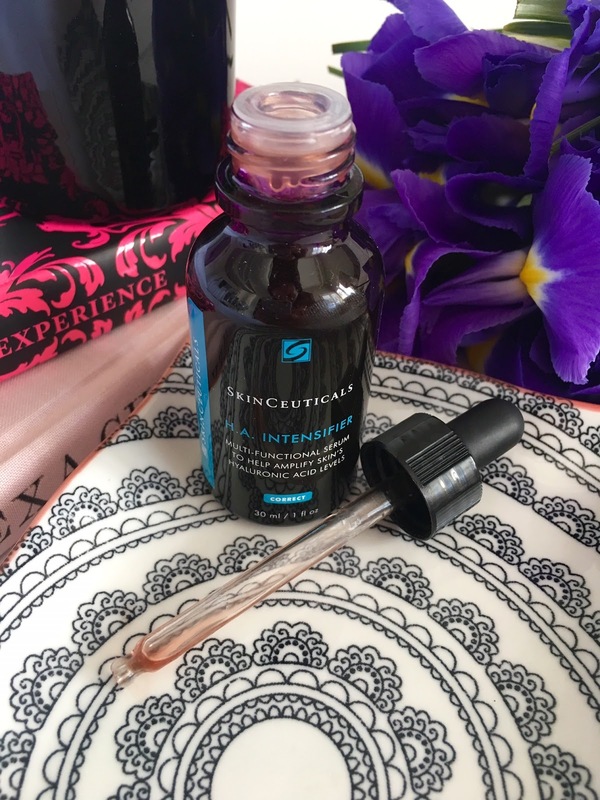 Intensifier with my beloved SkinCeuticals CE Ferulic (for an added boost of Vitamin C) during the day, finished off with a light layer of moisturizer and SPF. In the evening I use it on its own, followed by my usual night cream. This product genuinely works really well for my skin as the ingredients list is simple (so great for sensitive skins too) yet potent. I was actually applying this the other evening and thought to myself "I will 100% be repurchasing this". Side note: I tried this on Marc’s skin (more sensitive than mine) and he even commented on ‘how nice his skin felt’. This is what is going to give you that douse of hydration that your skin needs! The serum improves the HA levels in your skin by more than 30%! Read more on the basics of HA below. These natural preservatives help keep the HA content in the skin at a good level. The overall results will improve the skins appearance through boosted hydration levels; +23% improvement in skins plumpness and +17% improvement in skins texture. In a nutshell, it’s a large-chain polysaccharide found throughout our bodies. It plays the important role of maintaining the skins biochemical properties and is a natural humectant which helps maintain the moisture levels in our skin. Sadly, with age, the HA levels in our skin decline, therefore it is vital to include this ingredient into our routine to prevent saggy, dehydrated, dull-looking skin. Note: this is a very top-level view on what this ingredient does; this article on Paula’s Choice is very insightful if you want more info. In short, the H.A. 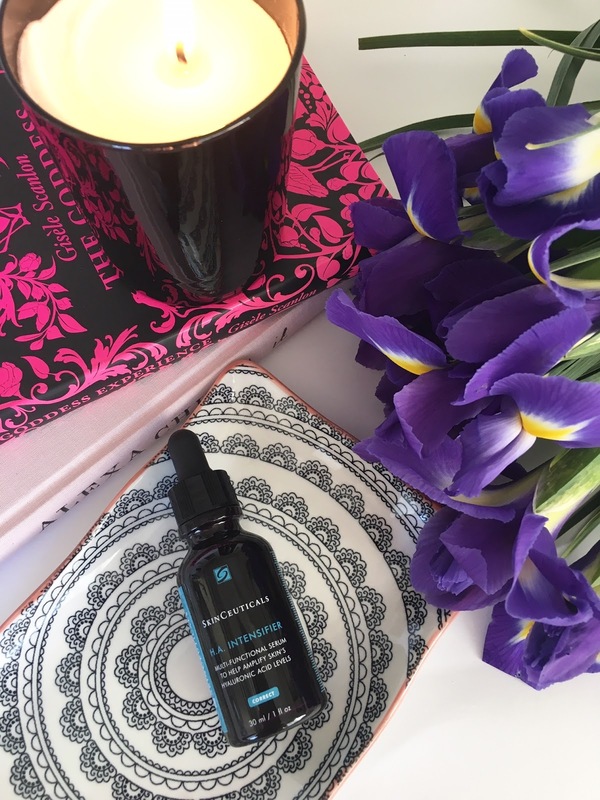 Intensifier is your purest form of Hyaloronic Acid to include in your routine and is something that is vital for every skin type to slow down the signs of ageing and keep your skin looking fresh, plump and youthful. Find a hidden element of HA Intensifier on Dermastore. The first to find, and complete checkout with this hidden element wins an HA Intensifier – it’s that simple! This post was done in collaboration with Skinceuticals.